The site of the former Cascade Linen Supply Co. building on Marcy and Myrtle is slated to undergo an environmental cleanup after contaminants were found on the property, state officials said. BEDFORD-STUYVESANT — A contaminated former industrial site set to become home to dozens of apartments in northern Bed-Stuy is slated for environmental cleanup, according to state officials. 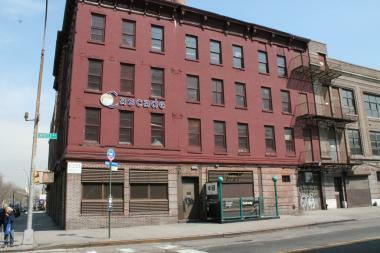 Land at the former Cascade Linen factory at Myrtle and Marcy avenues and Stockton Street was found to have contaminated soil, soil vapor and groundwater, with contaminants including lead, the New York Department of Environmental Conservation said. While the agency added that the site at 553 Marcy Ave. doesn’t pose a “significant threat” to people’s health or the environment, the contaminants beneath the property are still at levels exceeding state standards. The old Cascade Linen factory, a collection of buildings encompassing half the block, was sold for $27 million in 2013, records show. The industrial site, which is flanked by the nearby Tompkins and Marcy Houses, operated for decades in the neighborhood. Other past uses of the property included retail stores, an oil paint factory, a carpet cleaning facility, a bakery, a steam laundry, upholstery factory, a furniture manufacturer and a chemical factory, according to the DEC.
Its buyer, 553 Marcy Avenue Owner LLC, submitted an application to conduct an investigation and cleanup to the state’s Brownfield Cleanup Program, which gives developers tax breaks in exchange for cleaning polluted land. The lot changed hands again in March 2015, when the LLC sold the property to Cascade 553 LLC for $70 million, records show. Representatives for both groups were not immediately available for comment. More than 100 apartments are planned for new, separate buildings within the property, according to applications filed with the city. The field work for the investigation was done from August 2014 to September 2015, according to the DEC, and most recently, the former factory buildings at the site were demolished. Contamination on the property is below ground surface, so individuals involved in demolition work at the site wouldn’t have been exposed, the agency said. Excavation is allowed only on a limited area of the property with oversight from professionals. The state is proposing to remedy the contamination by removing underground storage tanks and disposing of spilled petroleum, contaminated soil and groundwater off-site. Once a new building is constructed on the property, sampling will be done to determine if anything remains that could affect occupants, according to the DEC, and provisions will be made to ensure the public isn’t exposed to possible contamination. The state is inviting the public to provide input about the cleanup plan, which will be approved by the state’s Department of Health and supervised by the DEC.
For more information on the contamination, the proposed cleanup and to submit comments, visit the DEC website here.